The idea of a 'woman's cave' came to me. Not a place for female friends, but a private place for me to be alone. It's a space where I won't have to make any compromise, particularly in design. I'd like my husband to visit me and feel like he's escaping from his normal environment, other parts of our home. It's not that I don't like my husband's style, it's that if we put effort in creating a space, I'd like it to accommodate him as much as me. I prefer the space we share to be a hybrid blend. The 'woman's cave' would be a private study. There'll be a day where I'll have a room of my own. I have a feeling when that happens, I won't have the energy or time to design it. So I'm taking my future self on as a client. I don't have any experience in design. She can't fire me, so she'll have to deal with whatever I come up with. A key lime pie shade on a building in my neighborhood. The orange shade I'm looking for is also found in a photo of a pineapple lamp by Maurice Van Es. Dusty lavender and light blue show up in a painting of dusk in 'The Bay of Naples with Mounts Vesuvius and Somma, 1782/1794 by Giovanni Battista Lusieri. 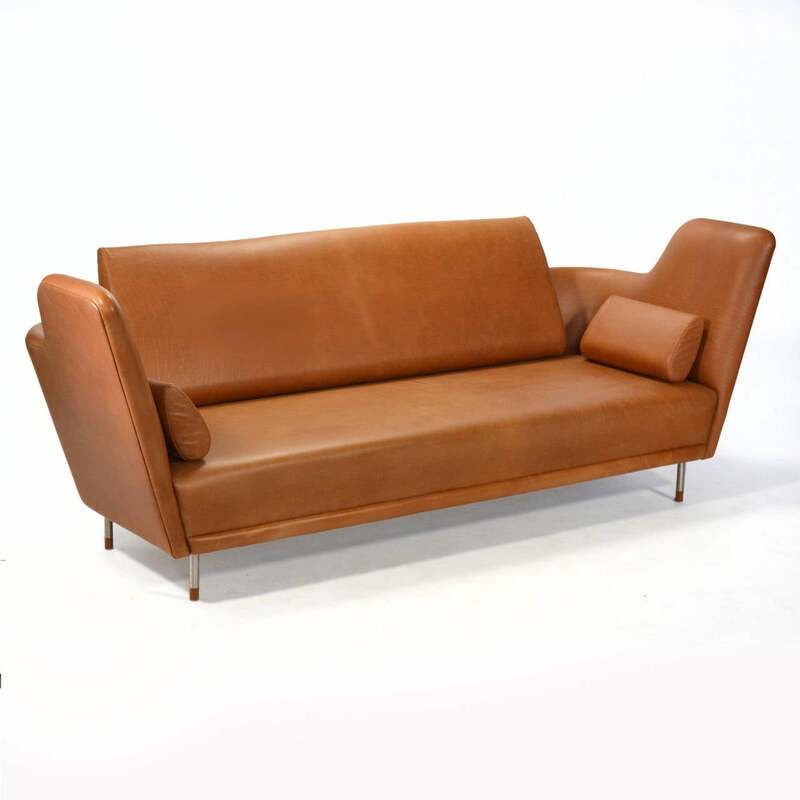 The orange is also on the cognac leather of Finn Juhl's 1957 'Tivoli' sofa. Since I've lived in apartments all my life, I've only bothered to paint the walls once--my apartment in college. Never again. It's a hassle to paint walls back. White walls have come to represent 'temporary space'. I've always wanted green walls. The grayish lavender is already in my life, it's the shade of my curtains and towels. Orange red has always impressed me, from the first time I stood in front of a Rothko of the same shade. I'm really combining all my favorite colors in one room. The colors look flat when depicted in the digital form. I tried to make a color palette like the pros. In order to describe what I mean and remember these ideas, I've included photos to show how the color looks in three dimensional spaces, with lighting and shadows. The textural qualities are just as important as the color. I also want a bit of warm metallic sparkle, like a flicker of a candle flame. Something similar to the modest shimmer of gold hardware on the lamp. The pastel key lime has been shade I've admired from Prada store interiors. It feels so refreshing to be surrounded in that color. The shade is on the furry textile by Sarah Neubert. While walking today, I found a building in my neighborhood with a similar shade and there happened to be a terracotta ash tray sitting on the balcony. Lastly, I'd like some warm white. Perhaps it can be done with plain white and warm lighting. Choosing colors is one thing, but selecting items and arranging them to reflect the palette is another. I hope I can deliver.